This card is one of the 3x4 cards from our SN@P! Birthday Set. I love this card because it's general enough to be used for so many different things in addition to birthdays! I love this card for a couple of reasons; first, I AM a “crazy cat lady” so anything cat-related is a top pick for me. I also love it because it’s just true - life is more fun if you’re having a good time, enjoying yourself, and being a little silly! I have always been a fan of wood grain, chevrons and rainbows. This card is the PERFECT mix of all three! It just makes me happy! This card would be perfect for so many things. A special note about the delivery experience or the baby, a small picture or two, or some memorabilia from the day. I'm loving the new 4x6 Sn@p Cards from the Good Day Sunshine collection. My favourite is the "Best Summer" card, I just love the ombre effect on this card because it's so bright, colourful, fresh & fun. This is one of my favourite cards, It just popped out at me for many reasons. Reminds me so much of a photo of my daughter’s formal, the hearts, the colours, and it brings many memories. I am actually designing her 21st invites around this card, can’t wait to get started! OK, now to more good stuff. At the beginning of this post I mentioned something about a giveaway! Enter via the Rafflecopter widget below by end of day Thursday, June 5th telling me which of our 6 cards is your favorite and why. On Sunday the 8th I'll draw one random lucky winner to win not only the cards we selected, but the rest of the cards that are included with each package the cards are from - that's 144 fabulous Simple Stories cards, people; you can see all of the cards one random lucky will win under the Supplies section below! Hi Simple Stories fans! Cari here with you today and I'm excited to share with you some layouts that I created using some of the new releases. The first layout I'd like to share is one I created using the Good Day Sunshine collection. I love the warmth of this collection and the super cute designs that capture what summer is all about. We live close to the beach and spend many summer days there. So my layout is about our last big summer day at the beach before school started up last year. The coordinating stickers, brads and chipboard add so much visual interest and texture. And I just love the new Enamel Dots. Love them!! The second layout that I'd like to share with you is using The Story of Us collection. This is a beautiful & romantic collection. I love the chalkboard theme that is throughout the entire collection. Plus you don't have to use wedding photos - the theme is love and you can definitely use other photos with this collection. The Enamel Dots in this collection sparkle - how fun is that? And once again, I just love how everything (stickers, chipboard embellishments, etc) all matches. It makes creating a project so much fun and easy to do. I simplified the design by moving the journaling space so it would be in line with the photos. I also eliminated the two small detail photos, and instead put a circular die-cut from the Bits & Pieces embellishment pack in their place. I am indeed so lucky to be the mom to these three boys! In total, our team created 27 projects for the magazine! See all the sketches and projects and download the May issue for free, here. Switching gears a bit, I’ve also had a lot of fun playing with the newest collections including Good Day Sunshine. I have loved every summer collection released by Simple Stories (remember 100Days of Summer!?) and this one is no exception. I decided to create a grid using 3x4 Sn@p! cards and photos of the same size. Summertime is upon us and the papers and embellishments from this collection were perfect for documenting my guys enjoying some of the some sweet treats I’ve been making for them such as popsicles and ice cream. We’ve made a few of our favorites, but have also been experimenting with new flavors like lemon-buttermilk sherbet and avocado ice cream. Yes, when you live in California avocado ice cream is not so strange! It is surprisingly good and even baby Sam enjoyed it! I’ve mentioned this before several times, but all of the collections from Simple Stories mix and match so well. The background paper for this layout actually comes from the Hello Baby Simple Basics Kit. I absolutely love the colored woodgrain in that collection and the blue was a perfect match to the colors in Good Day Sunshine. Howdy! Layle here today to share some fun news - we have 80+ brand new cut file designs, now available for the Silhouette! How about a little incentive to head on over and check out these and our other fun designs here at the Silhouette Online Store?!! Head on over, take a peek at all of our designs, then hop back here and leave a comment on this post telling us which design is your favorite. 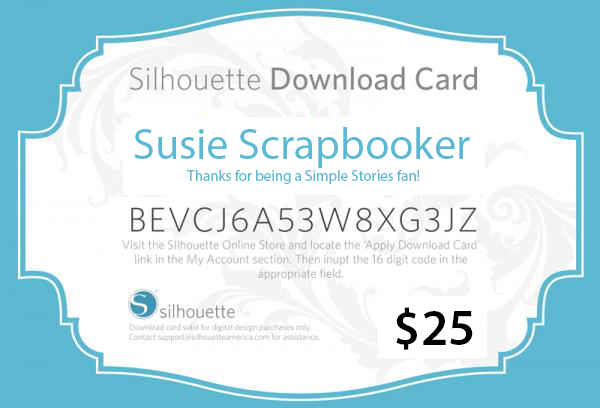 On Sunday the 1st, we'll draw one random lucky winner to win a $25 Download Card to the Silhouette Online Store! So tell us, which Simple Stories design is your favorite?! Giveaway is now closed; the random lucky winner is Craft Girl! We're super excited to introduce Simple Inspiration eBooks - free, downloadable idea books that you can look forward to with each of our new collections! Today brings you our newest eBook - the Good Day Sunshine Simple Inspiration eBook - 21 pages of amazing inspiration; simply click on the link below for your free download & enjoy! Visit the Project Downloads section of our website to download Simple Inspiration eBooks from our past collections, including Homespun, A Charmed Life and DIY. To see more projects using our Good Day Sunshine collection, visit our Good Day Sunshine Pinterest board here! This fun binder would make a great gift for Mother's Day or even to give mom after Mother's Day, with photos inside from your Mother's Day celebration! Sue added some of our Insta Square Pocket Pages to her album & inserted a few Instagram photos. With lots of room for journaling and hand written notes, wouldn't it be fun to have the kids/grandkids add personal notes in their own handwriting to mom?! Such a fun project! If you're looking for something fun for Dad or Grandpa for Father's Day, you could make the same type of album, but with our black Burlap SN@P! Binder and our Hey Pop! SImple Set! Hi, Angella here with you today, I am so excited to share with you what I have been creating with the new Good Day Sunshine collection. And as soon as I saw the new ranges I was so excited, I just could not stop smiling I had to start creating straight away. I have created this little Bus Caddy for a few snapshots of my niece who loves playing around in the sun, her smile is a true sunshine. I inserted a photo of her in a SN@P! Pocket - they're great for your little snapshots; just pop a photo or 2 into the pockets to showcase your memories. The 4x6 SN@P! Cards are perfect for journaling. For a great idea, fundamental 12x12 stickers matted onto cardstock and attached to straws make great embellishments. This month, let me introduce you to Rory Vaillancourt. I found Rory recently on Instagram and after she had tagged Simple Stories on her FUN dog layouts and couldn't wait to share them here with you! Hello. I am Rory - a Family first, Dog loving, Photography enthusiast, Scrapbooking fanatic, bicycling lover, Instagramming, Canadian girl. I don't have a blog but I am Kateroar on Instagram. My first layout was all based around this 'Wag more bark less' 3x4 card from the Dog SN@P! Set. It jumped right out at me - if only my dog Mags would understand this :) I chose some other 3x4 cards from the SN@P! Set and then made the two tags as a print and cut with my Silhouette. I chose words that make me think of Maggie. It was so easy with the cards, it all just fell into place. Thanks so much for sharing your great layouts with us Rory - and your cute dog, Mags!